While fine lines and wrinkles come with age, but some people suffer from them at an early age. If you too are aging prematurely, it’s time you start nourishing and reinforcing your skin. Castor oil has been used since many centuries to nourish skin. It is perhaps one of the best oils for wrinkles on face, under eyes, around your mouth and on neck. This super natural oil contains a powerful fatty acid, known as ricinoleic acid, that works as skin’s bodyguard. It fights against bacteria, reinforces skin’s barrier and helps improve skin’s elasticity, flexibility and hydration! It softens and smoothens wrinkles & fine lines over time. How Does Castor Oil Work To Get Rid Of Wrinkles? Castor oil helps your skin to remain looking youthful because it prevents premature skin aging. You don’t have to use expensive brands of anti aging creams and lotions when all you need to do is purchase one small bottle of organic castor oil, which will last you for several months. Here are the reasons why castor oil helps to reduce appearance of fine lines and wrinkles. Regular hydration and moisturization are necessary to maintain your skin firm and well toned. 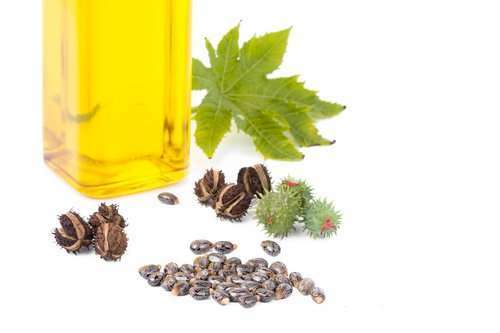 Castor oil contains natural emollient properties. The powerful fatty acids in it penetrate deep into layers of the skin and hydrate it from deep within. Castor oil stimulates production of collagen, which fills the gaps in your skin and invigorates it. Collagen retains elasticity of the skin and delays skin aging, thus preserves its youthful glow. The free radicals degenerate skin cells, and thus accelerates skin aging. The antioxidants present in castor oil avert this as they shield skin from the skin-damaging oxidizing agents. With regular oral application of castor oil, you can keep dull and sagging skin at bay. Speeds Up Skin Cells Regrowth. The presence of various nutrients, including omega 3 fatty acids & amino acids, help to stimulate the growth of healthy skin tissues and speed up healthy skin cells growth. Your skin needs more nutrients as you age, to prevent premature skin aging. Now since I have explained why castor oil is good in preventing wrinkles, I will share with you the best home remedies using castor oil to reduce your wrinkles! How To Use Castor Oil To Get Rid Of Wrinkles? Due to its moisturizing, anti-aging and collagen-stimulating properties, castor oil is a powerful natural anti-wrinkle remedy and thus works as an incredible natural treatment to remove wrinkles. It’s easy to use castor oil on your face. (i) Wash your face first with warm water and pat dry using a clean towel. (ii) Rub the castor oil between your palms & massage it gently all over your face until it absorbs. (iii) The natural heat of your hands evenly distributes the oil on your face. (iv) Let the oil stay on your face overnight and cleanse it off the following morning. Apply castor oil everyday at night before you sleep. This is an effective remedy to spot reduce wrinkles. It fortifies the hydrolipidic film & cellular membrane. It forms a robust barrier to protect skin in the long run. Mix well all the ingredients and apply around your eyes, forehead and around your lips. Leave it on for at least 15 minutes (more is better). Rinse it off afterwards using fresh water. Twice a day; in the morning and evening. You can also apply it before sleeping and leaving it on overnight. Here is a homemade serum that you can apply onto your face to reduce appearance of wrinkles and fine lines. (i) Put all the ingredients into a small glass bottle. Screw the cap and shake the bottle to mix the ingredients thoroughly. Your moisturizing serum is ready to use. (ii) Simply pour a couple of drops onto your fingertips & message gently the serum into your skin till it’s fully absorbed. You may like to focus on the areas that are more prone to deeper fine lines and wrinkles such as under eyes, around mouth and forehead. Twice a day; in the morning and at bedtime. Make sure to apply extra just before you sleep at night. Store the serum bottle in a cool, dark place. Almond oil a rich source of vitamin E, which prevents collagen dilapidation. It also has high amount of omega-3 fatty acids, which help moisturize your skin and avert premature skin aging. Mix the ingredients well in a small glass bowl. Rub the mixture between your palms and message gently onto all over your face, until it’s fully absorbed. Make sure not to apply too much of it. Let it stay on overnight and cleanse your face in morning. Apply it once daily at night before going to sleep. Coconut oil is effective in reducing wrinkles and fine lines under your eyes. It is an amazing moisturizer and contains great antioxidant properties. Its antibacterial & antifungal properties save your skin from aging & ward off premature wrinkles. Mix the two ingredients in a glass bowl. Dip your fingertips in the mixture. Message the mixture gently onto your face in circular motions, until it’s fully absorbed. Leave it there for 25-30 minutes & then cleanse your face. Apply it every alternate day. Blueberries are high in potent antioxidants, flavonoids – which slow down skin’s aging process. They are also a rich source of vitamin C that combats free radicals & inflammation – making your skin look young & radiant. Mix the two ingredients well & message the mixture gently onto your face evenly, leaving it on for 35-40 minutes. Afterward rinse it off and cleanse your face. Aloe Vera juice/gel helps restore your skin and regenerate collagen speedily. It also minimizes breakdown of skin’s collagen. Mix the two ingredients in a small glass bowl. Rub the mixture between your palms and message it gently onto your face, leaving it on overnight. Cleanse your face in the morning with clean water. Apply this remedy daily before you sleep every night. (i) All types of skin can benefit by applying castor oil, regardless of whether the skin is oily or not. In case you have oily/combination skin then start with using castor oil lightly. (ii) After using castor oil on a consistent basis for few days, you may see your skin is rebalancing itself. You may have to vary the quantity of castor oil you apply onto your face as it rebalances and adjusts to the new skin care regime. Try the above castor oil natural remedies, which will help soothe and reduce the appearance of wrinkles and fine lines on your skin over time. Your wrinkly skin will look more youthful in the long run.